Constructed in 1924, the Cheyenne County Courthouse is a rectangular, four-story, masonry block designed in the Classical Revival style. Distinctive features of the style include Tuscan columns, a projecting pavilion, and a flat roof. Architect Thomas W. Williamson designed the building with Thomas D. Howard constructing it. Williamson's firm designed three other county courthouses in Kansas. It was nominated as part of the "Historic County Courthouses of Kansa Multiple Property Submission" for its architectural significance and association with county government history. In 1920, entrepreneur Henry Hickert purchased land on a prominent downtown corner in Bird City, constructing a two-story, brick, Commercial style building that reflects restrained Classical ornamentation. As is typical with downtown commercial spaces, the first floor was designed for retail spaces, while living quarters and offices occupied the second floor. The building has been home to Farmers State Bank, McMillan's Drugstore, Gleason's Rexall Drugstore, a bus stop, the Bird City Post Office, a telephone office, and an office of the Bird City Times. The Heritage Corner Café now occupies much of the first floor. The building was nominated for its association with community development and as a good example of local twentieth century Commercial architecture. The construction of St. Francis' Sawhill Park was partially funded and completed in 1934 by the Civil Works Administration of the New Deal era. Local artist Howard T. Sawhill designed the site and oversaw its construction. Key park features include a bandshell, amphitheater, fountain, walkways, benches, and a concrete American flag all situated on an entire city block. 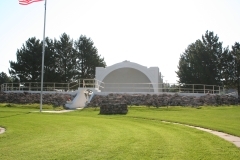 The horseshoe shaped concrete amphitheater with four rows of seats faces an Art Deco-style concrete block bandshell. Originally known as the St. Francis City Park, it was renamed in honor of Sawhill in 1966.